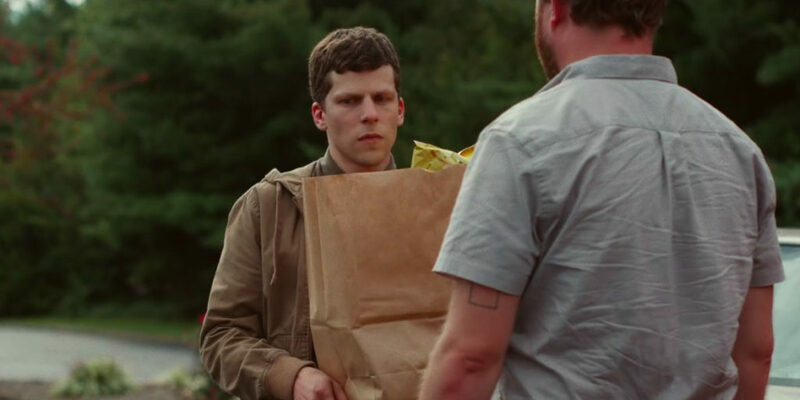 Jesse Eisenberg is a bonafide movie star. With 2010’s The Social Network, he delivered an iconic performance in arguably the best movie of the 21st century. Since then, he has made some interesting choices. Eisenberg has starred in lackluster indie films like American Ultra and Woody Allen’s Cafe Society. He has helmed an original franchise as a magician; he has also joined a struggling superhero universe as a bald genius. The Art of Self Defense is the best utilization of Eisenberg’s talents in years. Riley Stearns writes and directs the dark comedy, starring Eisenberg as a timid accountant who gets mugged one night getting food for his daschund. Stearns creates a slightly bent take on reality, using matter of fact dialogue similar to a Yorgos Lanthimos movie. Every character says exactly what they’re feeling. Even the answering machine makes a sarcastic crack at Casey’s loneliness. The oppression allows Eisenberg to really sink into his neuroticism. His character is always off-balance and one step behind. After visiting a gun store (and providing some satirical commentary on gun laws), he visits a karate dojo ran by a man who only goes by Sensei (Alessandro Nivola). Casey is awful at karate, but the discipline empowers him to stand up for himself in the office. Casey is devoted to Sensei, until he uncovers the dark underbelly of the dojo. The Art of Self Defense might not have the stylistic direction of Lanthimos, but Stearns executes the dialogue and the tone just as well. 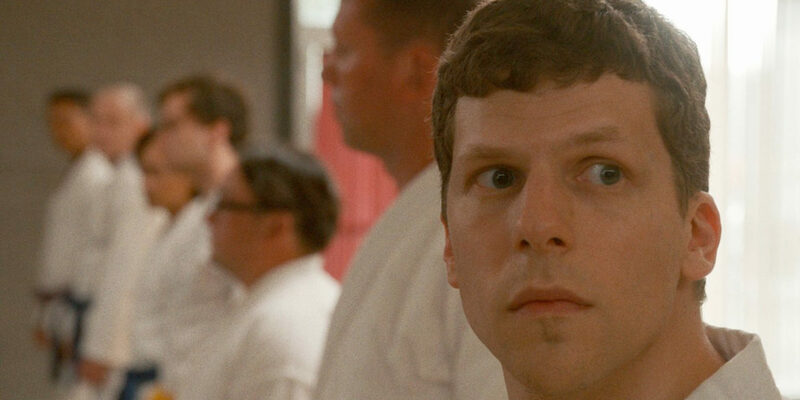 Eisenberg’s subtle performance is the perfect counterweight to the absurd arrogance of Sensei. The two characters represent opposing sides of masculinity. Stearns is interested in how testosterone and self-esteem affects a man’s relationship with violence. Imogen Poots plays a star pupil who is never taken seriously because of her gender. Her hardened exterior adds another important layer to the message of the film. As the movie progresses, it’s apparent that each member of the dojo has a public and private motivation for pursuing karate. Stearns writes fantastic comedic lines for Sensei, making him the perfect avatar for toxic masculinity. Watching Nivola and Eisenberg trade awkward verbal jabs is more entertaining than watching them trading real jabs. Eisenberg’s precise nonverbal acting alone makes Casey his funniest character to date. Some of the biggest laughs come from subtle reactions or his inability to maintain eye contact. Eisenberg’s most famous characters tend to be socially awkward but also cocky and clever. Casey’s lack of self awareness never makes him cool, and his overconfidence is more funny than intimidating. He truly believes that changing his music preferences from alternative soft rock to heavy metal will make him more of a man. He is the perfect conduit for Stearns’ dialogue, making The Art of Self Defense a quirky comedy and an unlikely highlight of Eisenberg’s intriguing filmography. Entertainment writer bringing you unapologetic reviews from Netflix, Hulu and Amazon Prime.